Difficulty: Wachusett Reservoir to River Street parking lot; Easy. This old rail trail is flat and consists of stone dust. River Street parking lot to Manning Street; Moderate. This section is hilly with a gravel surface. Not recommended for kids on bikes. Manning Street to Route 31; Difficult. This section climbs up a hill, then down the other side. Steep. Recommended for experienced bikers. To start at the Wachusett Reservoir parking lot; Take exit 5 off of I-190 and head south on Route 140. At the bridge where Route 140 south continues, turn right onto Thomas St. The reservoir will be on your left and the Thomas St parking lot will be on your right. To start from the River Street parking lot; Pass by the Wachusett Reservoir parking lot and turn right onto River Rd. Then take a right onto River St and look for the parking lot on your right. The trail heading up the hill goes to Route 31. The trail heading down from the sign board goes towards the reservoir. From the Wachusett Reservoir parking lot; Head past the map board and then right past the gate. 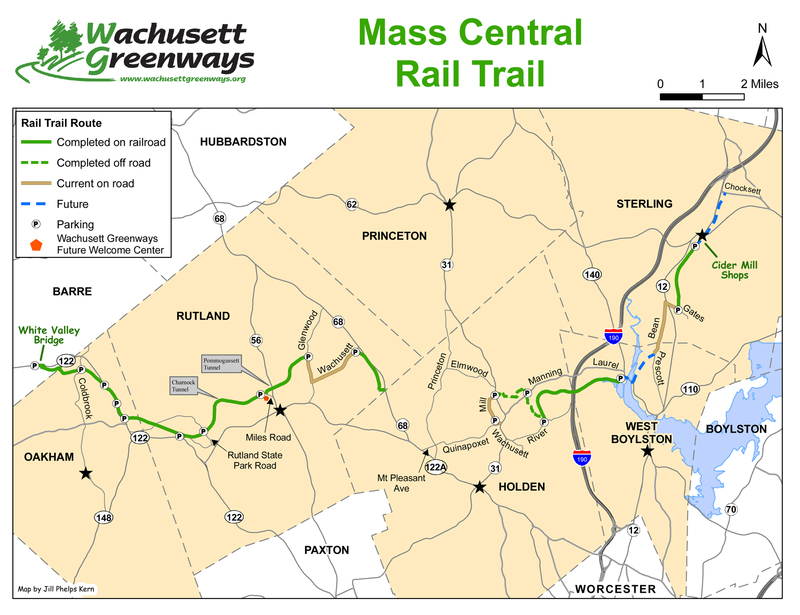 Note; Another section of the Mass Central Rail Trail; Sterling may be accessed on-road from here heading northeast. See; Route 140/Bean Road Connector below. This is all MA Department of Conservation and Recreation owned land. The Quinapoxet River follows the trail on your left. You will pass by two old rail cars painted green on your right. One is standing on end. These are used for training by the fire department. There are wooden signs nailed to the trees along the trail indicating the mile marks. There are also some picnic tables here as well as granite benches scattered along the trail. After 0.3 miles, you will pass by a trail to your left that leads down to a small dam. Across the dam is a stone Pump House that pumps river water up to Boston. On your side of the dam, is a granite sluiceway that brings water rushing through a narrow channel. Not sure of its purpose, but it would make a great water slide. Just past the ½ mile sign is an old granite marker on the right with an N on one side and a B on the other. This indicated the number of miles to Northampton and Boston. This was also the location of the old Springdale RR Station, which opened in 1881 and closed in 1892. Continuing onward, after you pass by the ¾ mile sign will be a granite bench on the right. There will then be two more benches on your left. Go to the first granite bench on your left. Standing in front of the bench with your back to the river, look across the trail for a 3-trunked Maple tree to your right. Behind this tree, under a rock and leaves is the Mass Central Rail Trail East Letterbox. Just after a mile you will cross underneath I-190, where there will be another signboard. Keep an eye out to your left after 1 ½ miles for the old foundations of the historic Springdale Mill. Built in 1865 and rebuilt again in 1875 after a fire, this mill site was razed in 1906. Today they are reclaiming the site. Right after the two black benches is a granite sign marking the entrance to this site. A path takes you to various granite sign posts describing the history of the mills and the dam that was used to power them. It finishes off at an old stone bridge abutment that crosses over the old rail line. Not to be missed. After 1 ¾ miles you come to an iron bridge over the river, where there are 4 granite benches. You'll cross under some power lines at 2 miles and then cross another iron bridge over the river next to two picnic tables at 2 ½ miles. The trail then comes to the River Street parking lot after 2.8 miles. When you reach the gate, the trail turns right up to the parking lot. There is another signboard here, a granite post and bench. Note; The trail continues up the hill, but consists of a rougher gravel and hard packed dirt surface. This section, unlike the previous section is hilly and not recommended for kids on bikes. Travel through a Hemlock forest and you'll come to another granite bench overlooking the river down below. After passing by a wildflower field you'll come to Manning St. Use Caution crossing over this busy road to the Manning Street parking lot after 3.8 miles. Another map board is located here. You then start a tough ½ mile trek up hill using switchbacks on a trail with a hard packed gravel base. After that you'll finally start to level out as you cross the ridge following the power lines. A big open field with expansive views. At 4.6 miles the trail turns right and starts back down the other side of the hill. This section is steep with some hairpin switchbacks. You reach Route 31 after 5 miles. Future plans are for a short on-road section down Mill St, to where the rail trail picks up again. Route 140/Bean Road Connector; To connect to the northern section of the Mass Central Rail Trail; Sterling, which also consists of stone dust, you have the option of on-road biking to reach the trail head. It's a distance of about 3 miles along residential roads and a section of hard packed, grass covered "woods" road. However, because it contains some steep hill sections and some rough surface areas I only recommend it for mountain bikes. Also, a short section is along busy Route 140 and so it is not recommended for children. From the Wachusett Reservoir parking lot; Turn left up Thomas St and then right up Route 140 over the Reservoir. Use caution, as the shoulder is narrow in spots. As you start up the hill, there will be a paved road on your left. This was formally Pleasant St. Take this road and go past the yellow gate where the pavement ends and a grassy "woods" road begins. This is roughly a ½ mile from the parking lot. The road heads uphill for roughly another half mile and then back downhill until you reach another yellow gate at 1 ½ miles. Turn left onto Prescott St, cross over a brook and some railroad tracks and travel up this narrow, residential road which in rough shape. The road crosses an invisible boundary and becomes Bean Rd as it enters Sterling. It eventually widens and becomes smoother. You cross over Boutelle Rd and just before you reach Route 12, take a right down Gates Rd, a short connector to Route 12. Cross over Route 12, using extreme caution as there is no crosswalk over this busy road. Continue down Gates Rd for a ¼ mile to the Gates Road parking lot located on your right. The trailhead for the Mass Central Rail Trail; Sterling is left across the road.